Due to the series of flooding tragedies in the Midwest, the times seems right to discuss water damage and its impact on Oriental rugs. The homeowner or insurance company may request heroic action due to the potential value of some semi-antique or antique rugs. This is salvage cleaning, and it requires careful pre-qualification with all parties due to the many variables in rug dyes, construction, fibers, type of contaminates, etc. With salvage cleaning the results will not be known until after completion of your efforts. A good relationship with the insurance company is critical, as time and materials can be spent without satisfactory results achieved for the insured. 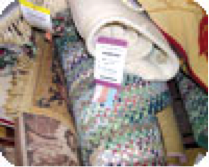 Many times, rugs are permanently damaged not from an incident, but from improper handling. As stated in the IICRC S500 Standard and Reference Guide for Professional Water Damage Restoration, a home furnishing item must be returned to the client in a sanitary condition; if not, disposal is recommended. To confirm a sanitary condition, the services of an industrial hygienist will be necessary. Due to the nature of contaminants found in a water loss, use an EPA-registered product to clean and sanitize rugs. Also, look for products that have WoolSafe approval so you know they have been tested as safe to use on wool rugs. Preliminary decontamination – Remove microbial contaminants by flushing the rug with clear water. Squeegee, wring or extract to remove majority of the water. Flush rug again with clear water. Squeegee, wring or extract to remove the majority of water. Immerse rug in water with a solution of a registered sanitizer (mixed at manufacturer’s recommended dilution ratio). Allow solution to remain in contact with the rug for at least 30 minutes (or per manufacturer’s directions). Squeegee, wring, or extract to remove majority of cleaner/sanitizing solution. Clean rug, then flush rug with clear water. Squeegee, wring, or extract to remove majority of water. Dry rug in dry room, or flat with air movers if there is a chance of dye bleeding. Have a confirmation test performed to determine sanitization efficacy. Prior to transporting, perform preliminary decontamination – remove microbial contaminants by HEPA vacuuming with an upright vacuum in multiple directions. Workers should wear P-100 respirators, nitrite gloves, long pants and long sleeve shirts. Cut an oversized piece of 6- to 10-mil plastic film to allow rug to be wrapped and effectively sealed. Roll rug in plastic film and tape all seams with duct tape. In an enclosed area with an exhaust ventilated to the outdoors, or in an enclosed area in which HEPA filtered air scrubbers provide 4-6 air changes per hour, workers wearing appropriate personal protective equipment unwrap the rug. First, HEPA vacuum, then put the rug through a dusting machine or air-wash using high-pressure compressed air. Prepare a solution of an EPA-registered carpet sanitizer and dampen surface of the rug per the manufacturer’s directions. Shampoo rug with a solution of an EPA-registered sanitizing product and a WoolSafe shampoo. Ensure rug is thoroughly saturated with the solution. Allow sanitizing solution to remain in contact with rug for at least 30 minutes. Flush rug with clear water. Squeegee, wring or extract to remove majority of water. Wash rug, squeegee, wring or extract water. Dry rug in a dry room or out in the sun if rug will tolerate direct sunlight. A confirmation testing can be performed to determine sanitization efficacy. The rug is identified and measured. If your employees cannot identify rugs by name, they should describe the rug in terms of color, design and size. Do not include the fringe when measuring, and note the size in feet and inches. Inspect the rug for damage and stains. Write down the information on a work order. The office will input the written information into their computer system no later than the following morning. In my opinion, in-plant total immersion is the most thorough method of rug cleaning and is required for water-damaged rugs. If your restoration company does not have a specialized rug-cleaning department, I recommend you sub-contract this type of cleaning out to those who are active in the rug cleaning business.